If you are like me, then everything from the Victorian age is pretty awesome. From the fashion to the culture, the Victorian era reminds us of simpler times, when social media, i-Phones and X-Boxes hadn't taken over our lives.However, one thing I am grateful about being born in the 21st century is the medical inventions. Can you imagine having an operation with no anasthesia and you must lie still and avoid screaming? That sounds like a real life nightmare to me! The sharp spike was driven into the patient’s skull to hold the instrument in place, then the doctor cranked the handle to turn the saw-toothed blade. The osteotome was considered superior to a reciprocating saw or hammer and chisel when it came to getting through human bone without splintering or damaging nearby tissue. 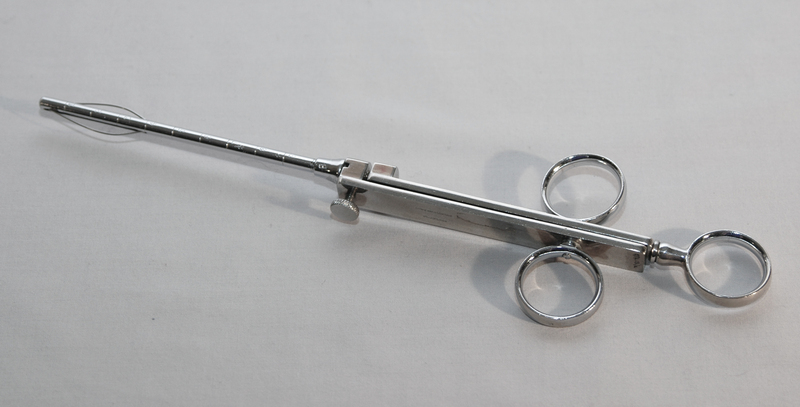 Later variations made the tool useful in arm and leg amputations and dental surgeries. 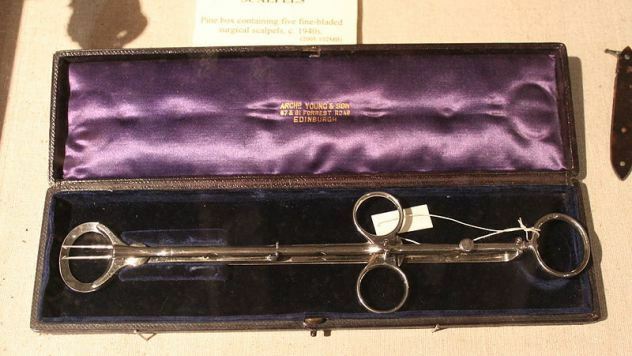 The instrument permitted a doctor to reach into a patient’s throat, pierce the tonsil with a fork as if spearing a cocktail wiener at a Super Bowl party, and sever the tissue with the guillotine’s blade. By the late 19th century, a mild anesthetic in the form of a cocaine solution was injected before the guillotine’s use. 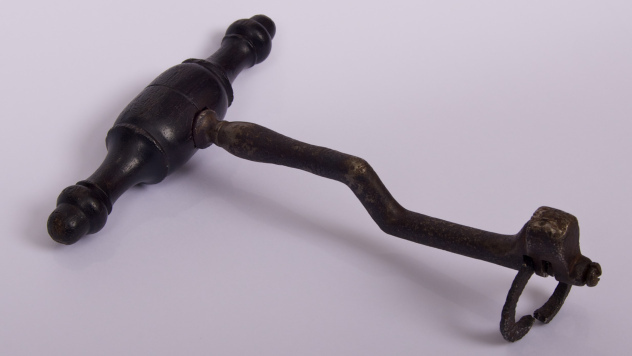 The instrument was a boon to doctors, who had previously risked being bitten while sticking their fingers into a patient’s mouth. 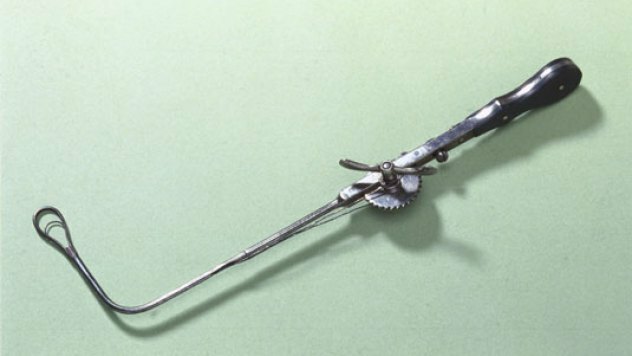 For the removal of hemorrhoids and other growths, tumors, polyps, and cysts in the esophagus, larynx, uterus, or ovaries, an ecraseur (French for “crusher”) was the instrument of choice. The loop on the end of the instrument could be a saw-toothed chain or a simple wire and was employed to strangle and crush the growth, preventing hemorrhage by restricting blood supply like a tourniquet. Ouch! The dental key allowed the doctor to clamp the patient’s tooth with the claw at the end of the instrument. By rocking or rotating the key, the tooth was levered out of the gum, roots and all—without anesthetic. It’s no wonder people held off treatment as long as possible. 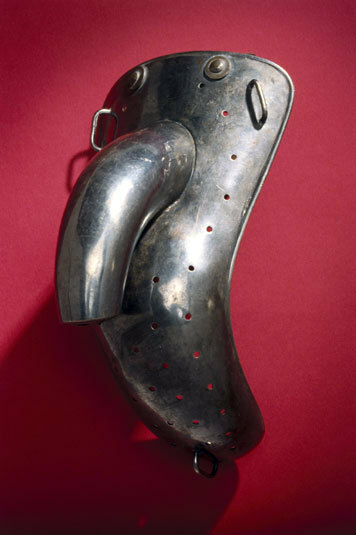 This is part of a male anti-masturbation apparatus from the late 19th century. This device attaches to a belt and was worn by boys to prevent them from the ‘sin’ of masturbation. 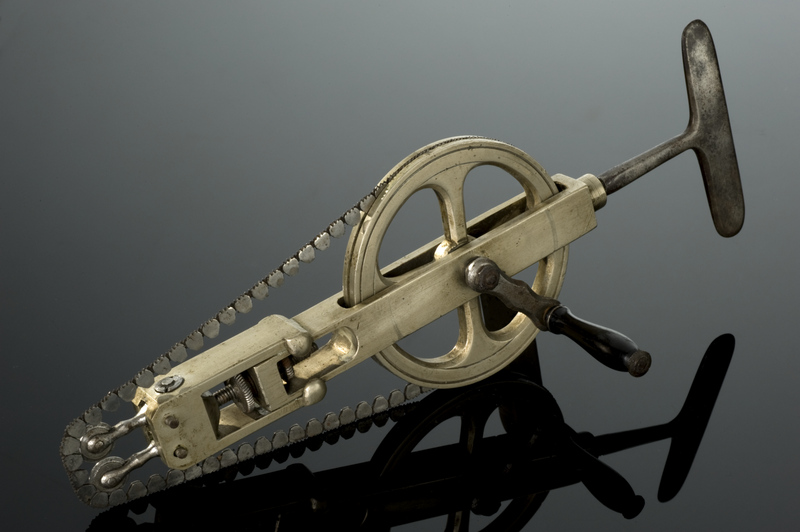 This chains-saw like blade of this unusual instrument is moved by turning the handle in a clockwise or anti-clockwise direction and is designed to saw through sections of the skull. They were used to remove fragments of bone in order to provide access for other instruments. It is the official symbol of The Chirurgeon’s Apprentice. 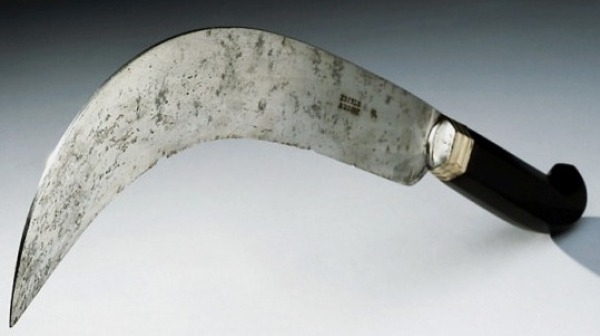 It was the popular tool of choice by 18th century surgeons who preferred to cut through the skin and muscle before amputating the bone. Brace yourselves for this one. The leuctotome was inserted into the patients tear duct and then lightly hammered into the thin layer of bone with a surgical mallet. It was then pushed into the frontal lobe of the patient’s brain about 1.5 inches and moved back and forth. The process was repeated in the other eye to complete the frontal lobotomy. Scary thing is that it isn’t such an early invention as it was evoked in 1967. If you enjoyed this get some unique steampunk collectibles you can keep to remember the past. 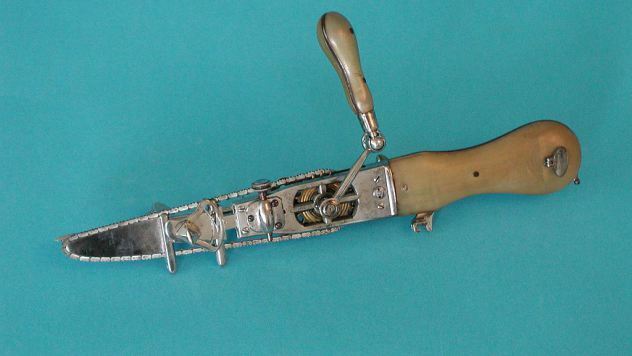 Do these early medical inventions freak you out or amaze you? Know of any other medical instruments from the past? Comment below. Courtesy of listverse.com, sciencemuseum.org.uk, thechirurgeonsapprentice.com.